Abstract: This is the second of two papers investigating the development of a silent attachment mechanism based upon a natural hooked structure. The paper draws upon Part 1 as a foundation. 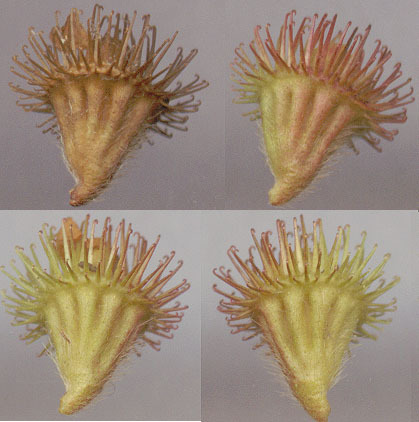 The functionality of a silent Velcro is analysed and compared with a study hooks of the form of the Arctium minus hook. Thereafter the development of a product based upon the form and functionality of Arctium minus hooks will be presented, including material selection and design. The result is a single-use, one degree of freedom modular hook, a hook that can pierce and anchor and which can be used singly or as a composite of multiple hooks according to requirements. The design is intimately linked to the form of the burdock hook and its supporting bract. The hook and shaft dimensions relative to the substrate are optimised according to the laws laid out in Part 1. The supporting bract is mimicked by a flexible, flat material that provides for a single degree of freedom and which supports its own adhesive attachment qualities such that the “bract” of each module hook can be attached to others in different configurations according to need and alternatively, to an object or structure that requires an attachment structure. The design is intended to be biomimetic, single-use and permanent, designed to fracture at the limits of the material properties and originates directly from the shape and function of the biological structure. This paper makes use of the design indicators from Part 1 to develop a prototype device for testing. Without testing it cannot be a complete design. The three aspects of product conception-to-production, the technical, product and industrial designs, cannot generally be completely separated. In this paper the technical design aspects shall be wholly covered, with the necessary considerations due to the other aspects of design being considered where appropriate, but not completely since it is a prototype that is being defined and not a finished product. The design continues from the end of Part 1, with an analysis of the proposed end goal, a silent Velcro. A comparison is made between the functionalities of burdock and the hypothetical silent Velcro and the differences are highlighted and thereafter the design proceeds with a product based upon the burdock hook and its functionality. The Arctium minus hook was not chosen at random. Reading of Nicklaus et al [‎1] in his discussions on plant evolution indicates that it is not the obscure biological structures that are the most successful but instead those structures and actions that are exhibited by the most species. Those structures that are functionally successful survive the evolutionary sieve. Hooks with a long shaft and a small diameter hooked tip have been studied by S N Gorb in a number of papers and he specifically states [‎4] that at the time of his writing there were no commercial lightweight attachment mechanisms that exhibited a flexible base as he found in the case of G. aperine. 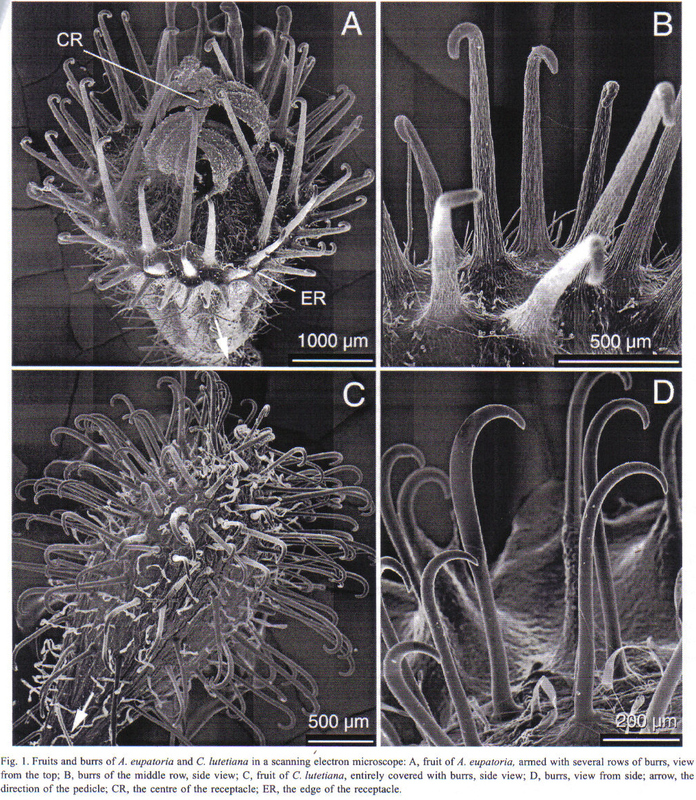 Figure 1, Figure 2, Figure 3 and Figure 4 below show some of the species that support hooks with a pronounced shaft and a small hook for grasping fibres at the tip. In this manner a design indicator found, i.e. that a long shaft and small tip is a successful natural design. It has been used before by George de Mestral, that is true, however the Velcro in common usage bears little resemblance in physical terms to that of a long shaft with a relatively small hook, in fact direct visual comparison as noted in the Conclusions of Part 1 show marked differences. Gorb has noted the following with regards to natural hooks: in terms of strength the longer the shaft the higher the strength. Thereafter, the larger the span of the hook, the higher the strength. Considering Figure 5 and Figure 6 below, they are the same image, the second having construction lines for the purposes of digitizing and transferring the data to a Solid Works design package. The result can be found in Figure 7 and is reproduced from Part 1. It can be clearly seen that the burdock hook tapers to a point. In his calculation of the Youngs modulus of the shaft, Gorb models the hook shaft on a tapered shaft and estimates the elastic modulus by applying a bending moment at a measured distance from the fixed base and applying standard bending moment equations (see Part I). It is tempting to assume that this taper continues through the curvature of the hook to the tapered point but as can be seen from Figure 6 this is untrue. In fact taking perpendiculars to the inner radius reveals that the diameter of the hook actually increases before decreasing to the point (see the seventh cross-section in the above diagram). As there is no opportunity for the biological process known as adaptive growth to take place it is assumed that this is a genetically derived trait. As this design develops this will have implications upon the manufacturing decisions and the final design. Figure 7 above shows the finished form having been transferred to the design package. This form, with modifications, will form the basis of the final design. The term “Velcro” is non-specific. Velcro as a generic term means different things to different people. Conventional Velcro as patented by George de Mestral (made of polyester resin) could be described as a releasable, reusable, probablistic hooked mechanical interlocking fastener. It is manufactured using a low heat source such as infrared light to soften the thermoplastic material and the nylon is woven through a material base in the form of threads. In the light of the previous section on the non-parallel profiles of the burdock hook, it must be considered that already a design choice has to be made: to abandon the manufacturing methods of conventional Velcro in favour of some other forming method. It should be noted that the term “Velcro” is also loosely applied to describe the form of metallic joining method that was recently developed to replace tacking when welding metallic plates together, which is a permanent join. So the word “Velcro” has come to mean a manner of joining two opposing surfaces together without adhesive using matching surface structures that generally speaking can be separated again without damage to the surfaces (although clearly this is not the case with the metallic Velcro described above and conventional Velcro does suffer a degree of mechanical failure to the substrate as mentioned in Part I). 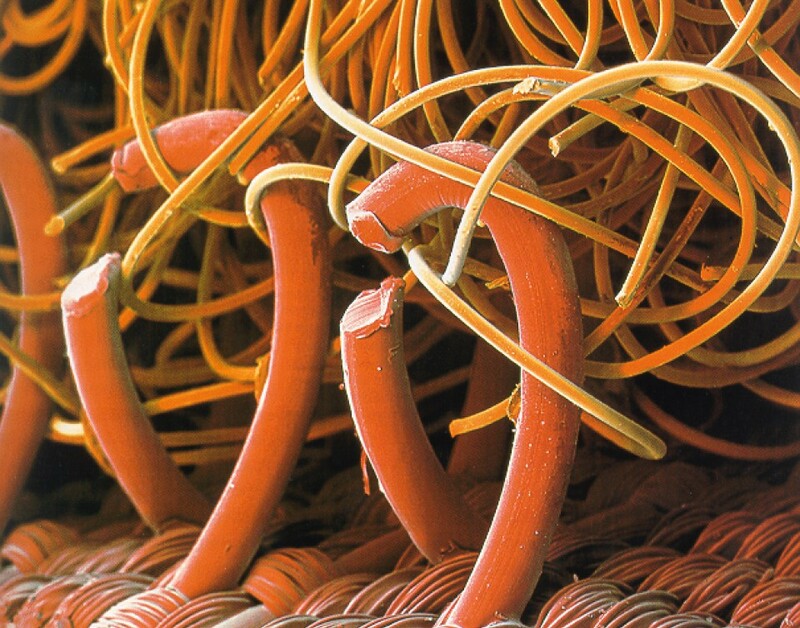 Further, it would seem that the term Velcro is no longer limited to hooked structures. On the contrary, fastener structures have developed and a new kind of fastener using mushroom shaped structures with a matching receiving surface is now commonly seen on the packets of commercially available rolling tobacco, for example. Nachtigall [‎7] defines a reusable attachment mechanism as being one of two types: those with a matching predefined surface and those with only a single mechanism without a predefined mechanism. The hook of Arctium minus is characterized as requiring a predefined substrate (fur or feathers) but it is single-use attachment device. Considering insect tarsi, “Performance and Adaptive Value of Tarsal Morphology in Rove Beetles of the Genus Stenus (Coleoptera, Staphylinidae)” by O Betz [‎1] and “Roughness-dependent friction force of the tarsal claw system in the beetle Pachnoda marginata (Coleoptera, Scarabaeidae)” by Z Dai, S N Gorb, U Schwarz [‎3] provide a sufficient insight into the relative performance of the tarsal structures, the claws and the setae which are also releasable devices without a predefined substrate. Their structures however are more complex including musculature and they are multi-use. Insect tarsi and their interactions with substrates will be addressed in a future paper. Attachment can be permanent or temporary. The strength depends upon material and shape. This proposal is set within the bounds of hook-shaped attachment mechanisms and the possibility of looking at parabolic fasteners is therefore artificially restricted. 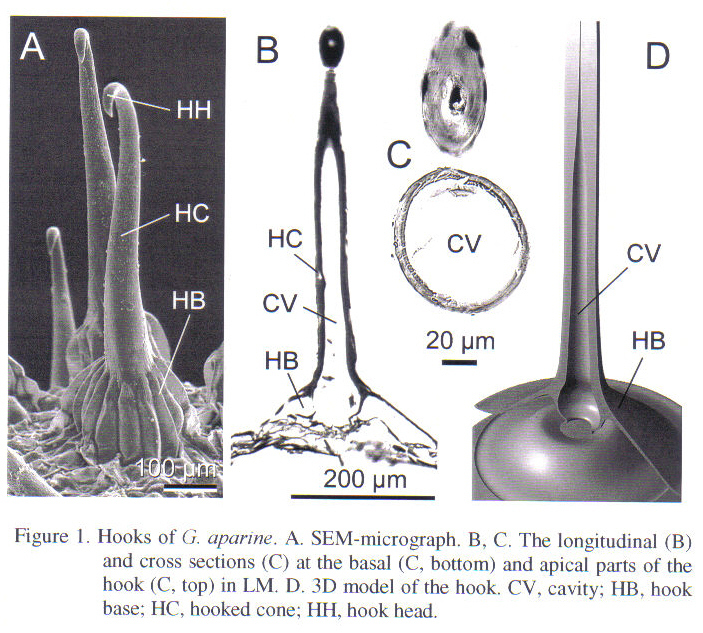 Hooks are modeled by Gorb as tapered shafts and material qualities are studied in his paper “Natural Hook and Loop Fasteners: Anatomy, Mechanical properties and Attachment Force of the Jointed Hooks of the Galium Aparine Fruit” E V Gorb, V L Popov, S N Gorb [‎4]. This work could be adapted to model a dual hook combination. His work on parabolic fasteners [‎5] includes modeling the ratio of attachment to detachment force which can serve as a form of control mechanism in advanced designs. From observation burdock hooks with a shaft diameter at the hardened tip of approximately 100 microns and a hook radius of approximately 200 microns. These have the ability to pierce or thread easily between fibres. The hook is tapered to a sharp point, a property that is not present in conventional Velcro due to manufacturing compromises. That is to say, the blunt tip of the Velcro hook is due to the fact it is found not to be necessary for it to be sharp provided a bespoke substrate of provided. This also prevents the Velcro hooks from attaching to any or all but predefined points, a form of control mechanism. Gorb discusses probabilistic fasteners and he states that it is parabolic fasteners and not hooked fasteners that yield the best possibilities for investigation in nature when considering frictional interlock alone [‎5]. In the case of the standard Velcro, mechanical interlock and friction between substrate material and hook results in attachment. As was discussed in Part I, scaling effects reduce the effects of inertia and the effects of gravity are reduced. The same is true for burdock. The standard Velcro attachment mechanism has to be resilient enough to withstand the repeated attachment and detachment motions with minima damage to both surfaces. Flexibility is required as is a long term resistance to fatigue fracture, or resilience. This is covered further in the section on material specification. As mentioned previously there are variations as to the interpretation of the word noise. The environmental agencies will have one version in terms of suburban noise, for instance. There is also the relationship of audible noise to audible frequencies. What is certain is that any vestige of attaching force that is present will imply a loss of energy when it is released. For more on this see the section on material specification where the physics of material properties is discussed and those properties that influence sound generation. This describes the ability to attach randomly without precise matching of surfaces. Velcro is a probabilistic fastener, a field of structures facing a field of artificial fur which enables a random positioning to occur. The burdock fruit supporting its numerous hooked bracts is a spherical field of structures, the substrates of either fur or feathers again, are fibrous fields that enable a random, non-aligned attachment to occur. The product Velcro as patented by George de Mestral is a successful product. He developed this over twenty years, finally going into production in the 1940’s. He says and this probably is true that he derived the idea from observing the attachment of a burdock hook to a dog’s fur. In attempting to produce a “silent Velcro” it could be deemed sufficient to use conventional Velcro as a starting point, after all a significant amount of research has already gone into the product. However it is clear that there are significant differences between the burdock hook and Velcro. Revisiting the original is appropriate even if the end result is not the product requested. Biomimetics is the goal and the theory sought to be justified, not just product design. The term silent Velcro actually means a silent, reusable, probablistic attachment mechanism with a bespoke substrate. It does not define the attaching structure which could have any shape including parabolic, hook, mushroom, nor does it define the nature of the substrate, merely that it should be part of a matching system. Strictly speaking it does not define the component material nor the application. Reconsidering the detailed structure of the burdock hook provides design indicators for alternate products to conventional Velcro which may or may not be original and which may or may not have commercial application. While a single burdock hook may be of a shape to provoke fracture before separation, its presence in a spherical field of hooks provides the burdock fruit with opportunity to both re-attach and to become enmeshed in a fibrous substrate as surrounding hooks to those associated with primary attachment are capable of bending on their flexible bracts in the direction of the substrate thereby increasing the attachment strength and difficulty of disentangling the fruit from the substrate. From observation of burdock hook behaviour it is clear that its natural hosts are not the only substrates that are capable of providing support to it hooks. The burdock hook is capable of attachment to manmade fibres and woven fabrics such as denim. They are sharp enough to gain purchase even in the fibre-less substrate of flesh albeit an attachment of less secure properties. Figure 2 above shows a space diagram of attachment mechanisms. Not the locations allocated for “Velcro” and for “staples”. At this early stage it is anticipated that the resultant product of this design will be more permanent than “Velcro” (a downward shift on the axis) and stronger than “Velcro” (a shift to the right) placing it in the position occupied by epoxy or needle and thread. But it is hoped that the resultant attachment mechanism will not require an insertion device such as a stapler and the application will be less cumbersome than a needle and thread. The burdock hook has a distinctive curvature and thickness that encourages fracture. It has a supporting flattened bract which enables flexibility in a single plane. It is constructed of cellulose, a composite biomaterial that has anisotropic properties and which, when desiccated, is brittle in shear. It functions as part of a composite structure, a field of hooks surrounding a spherically shaped interior. It requires a fibrous substrate but it can attach to a huge variety of substrates due to its morphology and toughness. There is an intimate link between shape, material and function. This implies that the shape will change according to the composition of the component material which will in turn have an impact on the functionality of the structure. There is no reason to believe that nature provides for perfect designs, only energy efficiency. Functionality rules the prevalence of structures. Structures with inadequate functionality do not survive the evolutionary sieve. Structures that are common to more than one species indicate a level of functional success. ‎[7‎, 8] Hooks of the same shape as the burdock hook, with long shafts and exhibiting apical growth occur in a number of species as noted in Part 1 of this study. Evolutionary studies (see Nicklaus et al [‎9]) show that discontinuities do exist resulting from ecological changes that can lead to the disappearance of structures regardless of their functional ability and therefore studies devoted to natural structures will always have a degree of uncertainty. Natural mechanisms may not be original in the history of mankind’s own technologies which are based upon artificial materials that are used for product manufacture. On the other hand, exploring natural structures without recourse to a database of patents allows for a true investigation of the capabilities of biomimetics to yield real product in conjunction with a designer’s own imagination and knowledge. The structure of the burdock hook, its supporting bract and the fruit itself naturally leads to a product that is going to take a modular form, beginning with the hook and supporting bract. It is noted that each hook and bract originates from the calyx of the burdock flower. This is itself is an attachment mechanism, attaching the bract to the fruit and a permanent attachment mechanism in fact. Figure 4 shows the burdock fruit. Note the parallel rings of hooks circumscribing the fruit. Each hook has flexibility due to the flattened onion-like bracts. The hooks are all closely aligned yet they do not interact. Each acts as an individual hook taking a portion of the load which has to be large enough to separate the fruit from its supporting twig and the mass of the fruit itself is not enough to cause separation until forces and dislodge the fruit. Inexact extraction results in additional hooks becoming engaged, the attachment force increasing and the fruit becoming further enmeshed in the host’s fur or feathers. The above three lines fully describe the initial goal of the design: a modular hook with flexibility in a single plane to aid attachment through a flattened base which in turn supports its own attachment mechanism such that it can be attached to a structure or other hooks singly or in multiples. The hooks are to be of single use (designed to fracture) initially. The full functionality shall be defined by the nature of the composition of the structure created by the assembly of component hooks. They shall be designed with a sharpened point and a narrow needle-like profile for insertion and adhesion to woven fabrics and fibrous materials. The hook shall originate from a flattened support that will be flexible in nature and which will be open to further develop as will be illustrated later in this paper. Digitize structure profiles to obtain the sweep path. Section the structures with a microtome and digitize the sections to gain the shapes. Preserve the sectioned material for analysis for signs of trace materials and other non-homogeneities in the material. Reconstruct the structures in Solid Modeling and reassemble them. This technique was used to obtain the images in Figure 7 of ‎Section 1. The question of intelligent design and perfection in nature is taken to have been addressed by the work of Allmon and Ross (1990) as cited by Nicklaus [Error! Reference source not found.] and by Howe and Smallwood (1982) [Error! Reference source not found.Error! Reference source not found.] and S H Bullock (1997) [Error! Reference source not found.] and it is therefore sufficient to merely state here that for the purposes of biomimetic study, biological structures must be treated as they are without regard to their origins or reason for being and examined for design indicators that can be utilised for the purposes of modern design and manufacture. To assume perfection in Nature’s design is a fallacy. All that can be assumed about nature’s designs is energy efficiency with available materials. The TRIZ design approach that indicated a natural solution would indicate that this solution was the best solution. But only a zoologist or a morphologist would, it seems, really consider this to be the case (see D’Arcy Thomson “On Growth and Form” [Error! Reference source not found.] Chapter 1). The best that an engineer/scientist can hope for is a physical or chemical property that can be exploited or mimicked in some fashion. But this could be an example of engineering prejudice, for how many biological structures and mechanisms have truly been studied with our “new eyes”? TRIZ appears later in Part II for, if one considers that a biological structure is efficient in terms of material and energy, then the problem for an engineer with regards to biological structures is to apply TRIZ in reverse, to recognize what one is seeing and find a place for it in technology. For more on TRIZ see [Error! Reference source not found.]. Figure 2 above comes directly from the Vincent and Mann paper. Note the area that Velcro occupies, an attachment mechanism of relatively medium strength and re-usability (see Figure 3 – Commercial Velcro from [Error! Reference source not found.]). The stated aim of this research project was to design an attachment mechanism using hooked structures that would occupy a space with the additional pre-requisite that it would be silent in action. It did not say to use burdock as a reference to produce this attachment mechanism. But, given the research that S N Gorb has already devoted to cellulose hooks, Arctium minus is a suitable example to use to illustrate and enhance his methodology. This, Part I, demonstrates Gorb’s technique and Part II is devoted to material selection and product design and development.